Almost the weekend, yay!!! Hope everyone's having a great week! I have a very busy few weeks ahead with ADOP, lots going on! But I wanted to share this cute custom nursery set that I did recently for a client. 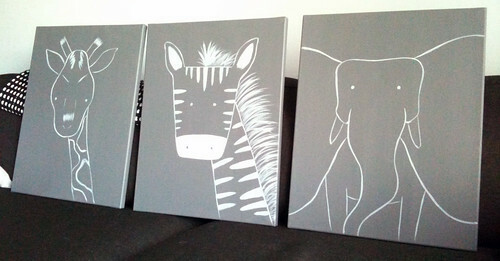 Her little boy is going to have a navy blue room, and she was looking for a set of three nursery paintings (the giraffe, the zebra and the elephant) in grey. She also wanted a solid background...which has me thinking more and more that the background should always be solid in these. Hmm. I love this set, love that she went with all grey. Let's hope her little one loves them too! I am hoping to add more nursery paintings to the shop soon, and I have a few other ideas for this line down the road. Very excited! !